← How to change PDF form to flatten PDF under Mac system? Question: How can I convert PDF files from version 1.1 to 1.4 (or higher)? Actually I need some sort of command line tool for batch converting or some API to be able to convert dynamically sever all documents. safe to ignore it. Actually if you feel this is a little complicated, you can use software VeryPDF PDF Editor can help you change PDF version directly through software interface. Please check details from the following snapshot. 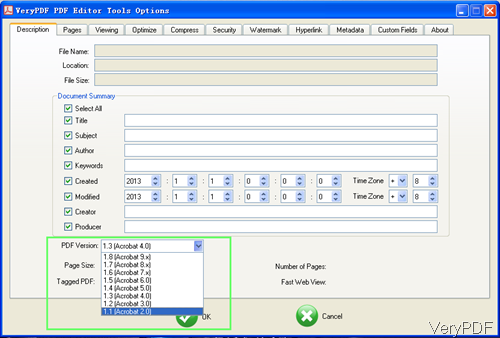 If you need to use the command line version, please choose the PDF Editor OCX Control (ActiveX). During the using, if you have any question, please contact us as soon as possible. How to convert pcl to pxl via command line?